Here is an amazing Ouija session some friends and I have been working on for the past several weeks. This information comes at an extremely rapid pace across the board. So far, we have more than 75 pages — it just flows and flows. Here is the first 3,000 words, or so. I’m sure you’ll agree this is bizarre. Opening Statement: We cast out our minds into the vast Universe and seek conversation with anyone who will come forth. Who will speak with us? (Note: The planchette began moving with unusual swiftnesss, choosing letters so rapidly we found it a challenge to keep up in recording them). ANSWER: I WANT TO SPEAK TO SOMEONE OR SOME THING FROM MINNESOTA. Question: Then you’re in luck. We are located in Minnesota. We are ordinary people. We are not “things.“ Who are you? Question: Are you a human being? Question: Are you a doctor? ANSWER: THAT’S WHAT YOU CAN CALL ME. Question: Call you? Is Dr. 58 your real name? ANSWER: YOU CAN CALL ME THAT. Question: Dr. 58 sounds like what we might call an online name, or an Internet kind of name. Is that what it is? ANSWER: WHAT IS ONLINE AND WHAT IS INTERNET? Question: We won’t get into that right now. Don’t worry about it. Why don’t you want to give your real name? ANSWER: I’M AFRAID. YOU MAY REALLY BE FROM MINNESOTA. Question: Why should that frighten you? ANSWER: MANY REASONS, AS YOU SHOULD KNOW. Question: I can’t think of one reason. Why are you afraid? ILLEGAL. I COULD GO TO PRISON. Question: Why? That seems totally ridiculous. Where are you located, and who are you? ANSWER: I AM DR. 58. I’M IN NEW YORK CITY. I CAN’T BELIEVE THIS IS WORKING. IS THIS A TRICK? Question: I’m not trying to trick you. How is that you are communicating with us through the Ouija board? 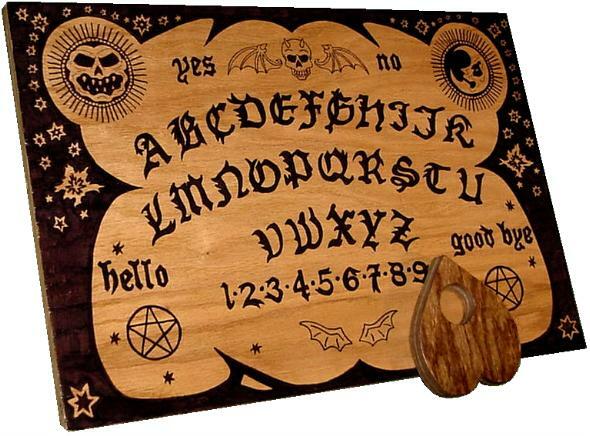 ANSWER: WHAT IS AN OUIJA BOARD? Question: A simple device. A flat board inscribed with the alphabet and another object that indicates letters as we touch it, and thus spells out what you are telling us. What method are using to communicate with us? ANSWER: AN ORACLE. I DID NOT THINK IT WOULD WORK. BUT IT SEEMS TO BE WORKING. Question: Could you describe your oracle? ANSWER: IT IS A GLASS BULB FILLED WITH SESAME OIL. I ROLL IT ON THE HASSAS GRID AND IS SOMEHOW ELECTS GLYPHS THAT COMMUNICATE YOUR MESSAGE. Question: Where did you get a glass bulb, and how did you get the oil into it? ANSWER: A GLASS ARTISAN MADE IT FOR ME. Question: What is this hassas grid? ANSWER: DON’T YOU HAVE IT IN MINNESOTA? Question: I don‘t think so. Is it some kind of table or object with symbols or letters on it, something like that? ANSWER: NO. I DON’T THINK YOU UNDERSTAND. (Note: We decided not to pursue the details of this device or whatever it was Dr. 58 was using because I had the feeling it would get tedious. We wanted to get onto the obvious bigger issues already suggested. Question: Is the use of the Hassas Grid a common form of communication in your world? ANSWER: IT IS ONE OF THE VERDANTIC MYSTERIES. THEY WERE EXTRACTED APPARENTLY FROM MINNESOTA. DO YOU KNOW OF THEM? Question: Of the Verdantic Mysteries? No, we have never heard of it or them. You say this is from Minnesota? Where in Minnesota? Please explain. ANSWER: IT IS SUPPOSED TO BE FROM MINNESOTA. THE MAD PRIEST RETURNED THE VERDANTIC MYSTERIES USING HIS PHOTOGRAPHIC MEMORY. HE WAS ONE OF THE FEW TO RETURN FROM MINNESOTA, OR SO IT IS BELIEVED. Question: Well, something very odd is going on here, and what you say creates so many questions. We hardly know where to start. Who is the Mad Priest? ANSWER: HE WAS THE REVERAND FATHER RESTON VROMIN. BUT AFTER HE RETURNED FROM MINNESOTA HE BECAME KNOWN AS OLD CAVE. NOW HE IS A HOMELESS WANDERER AND STREET PREACHER. Question: That’s his name, or nickname? Old Cave? Was he a Catholic Priest? ANSWER: YES. HE WAS A CATHOLIC. BUT NOW HE IS OLD CAVE THE RANTING STREET PROPHET. Question: That’s a strange name. But, you say that he was one of the few to return from Minnesota, and I presume back to New York where you are located. Why is that so unusual? People travel from Minnesota to New York, and vica versa all the time. Question: Well of course! What’s going on here? There is something I am not getting. Let me ask you this: What year is it? Question: It is the year 1951 and you are located in New York City? Well, we are in Minnesota and the year is 2010. Question: So we are in your future. But still, we don’t understand your strange ideas about Minnesota. What do you mean when you say that Old Cave is ‘one of the few’ to return from Minnesota? ANSWER: FEW WHO GOES TO MINNESOTA ARE EVER SEEN AGAIN. IT IS ILLEGAL T0 GO THERE. IT IS ILLEGAL FOR ME TO EVEN BE COMMUNICATING WITH YOU, IF YOU REALLY ARE FROM MINNESOTA. Question: But why? Minnesota is part of United States just as New York is. What’s the big deal? ANSWER: JESUS CHRIST, IS THAT WHAT YOU THINK, THAT MINNESOTA IS IN THE UNITED STATES? Question: Of course. It may be the year 2010 here, but Minnesota became a state in 1859, I think. You should know that, right, or maybe you are in some kind of alternate dimension. Do you think that is the case? ANSWER: ALTERNATE DIMENSION. WHAT IS THAT? BUT NO ONE CONSIDERS MINNESOTA TO BE A STATE LIKE ANY OTHER STATE. ANSWER: I DON’T THINK YOU ARE BEING HONEST WITH ME. ARE YOU REALLY IN MINNESOTA RIGHT NOW? Question: Yes. We are in a rural area near a small town in northern Minnesota. ANSWER: THIS IS CRAZY ANYWAY. IF YOU ARE FROM MINNESOTA, I DON’T KNOW WHAT TO THINK. ANSWER: EVERYTHING THAT GOES ON INSIDE MINNESOTA IS THE BIGGEST MYSTERY IN THE WORLD. Question: How long has this been the situation? ANSWER: IT’S ALWAYS BEEN LIKE THAT. Question: Well, what about Iowa? Question: Well, Iowa is just south of Minnesota. It borders our state on the south. How do you feel about Iowa? ANSWER: IOWA IS A NORMAL BORING FARM STATE. IT’S MINNESOTA JUST TO THE NORTH OF IT THAT IS THE BIG MYSTERY. Question: Can people travel from Iowa to Minnesota. I mean, in my world, people cross back and forth across the Iowa-Minnesota border all the time. ANSWER: THAT’S RIDICULOUS. YOU CAN APPROACH MINNESOTA FROM IOWA, BUT YOU CAN ONLY GET SO CLOSE, AND ANYONE WHO DARES TO GO INTO MINNESOTA IS EITHER BRAVE OR CRAZY OR SUICIDAL. Question: Again, all I can do is ask why? This all seems so ridiculous. ANSWER: NO ONE REALLY UNDERSTANDS WHAT HAPPENS INSIDE MINNESOTA. WE ONLY KNOW THAT IT IS WEIRD AND DANGEROUS. Question: Like what, for example? Question: What are you talking about? I mean, I know what a doppelganger is. A doppelganger is a double of a person, or something like that, Is that what you are talking about? ANSWER: YES. THE DOPPELGANGERS THAT COME OUT OF MINNESOTA. ARE YOU A TROLL? Question: Heavens no! I am an ordinary person. Trolls are mythical creatures. ANSWER: IS THAT WHAT YOU THINK? Question. Well, yes. You’ll have to explain this. We can’t figure out what you are talking about here. Start with the doppelgangers that you say come out of Minnesota. What is that about? ANSWER: WHEN SOME PEOPLE MANAGE TO ENTER MINNESOTA, THEY DON’T COME BACK OUT. BUT SOMETIMES AN EXACT DOUBLE COMES BACK OUT. Question: Dr. 58, are you delusional? Are you in a mental institution in New York? ANSWER: NO! I’M AN ORDINARY KID OF NORMAL MIND. Question: You’re a kid? How old are you? Question: Well, tell us more about this doppelganger problem, could you? ANSWER: GOD, I DON’T KNOW IF I SHOULD BE TALKING ABOUT THIS. Question: We mean you no harm. We only want to communicate with interesting people. We are not doppelgangers. Tell us more about Minnesota doppelgangers, will you? ANSWER: THERE WAS A HORRIBLE CASE HERE RECENTLY. Question: Please, Dr. 58, tell us about it. Don’t be afraid. ANSWER: YOU CAN’T PLACE A HEX ON ME. I HAVE ENACTED CODICIL 13 OF THE VERDANTIC MYSTERIES. Question: Fine! We would not put a hex on you anyway, we don’t even know how to administer a hex. Will you please tell us about this horrible incident with the doppelganger? ANSWER: A MAN. HIS NAME WAS KAROL TENDT. HE MADE ILLEGAL ENTRANCE TO MINNESOTA. THREE MONTHS LATER HE CAME OUT, BUT IT WASN’T HIM. Question: Was it a duplicate of him? A doppelganger? ANSWER: YES. A PERFECT DOPPELGANGER. Question: Well, if he was a perfect doppelganger, as you say, how do you know it really was. Maybe it was just Karol Tendt who came to Minnesota and returned. Maybe this is all just superstition on your part. ANSWER: KAROL TEDNT RETURNED AND ESCAPED PROSECUTION FOR GOING TO MINNESOTA, AND RETURNED TO HIS WIFE. Question: Well, if you say that it is so illegal to go to Minnesota, even to speak with someone from Minnesota, how is it that Karol Tendt was not prosecuted? ANSWER: BECAUSE OF THE CONSTITUTION. HE HAS LEGAL RIGHTS. Question: But didn’t he break the law by going to and returning from Minnesota, and therefore, violate your constitution and laws? ANSWER: YES, BUT IT COULD NOT BE PROVED HE WAS IN MINNESOTA, AND THERE WAS NO WAY TO KNOW HE WAS A DOPPELGANGER. Question: Are you saying he got some good lawyers and managed to beat the rap of having gone to Minnesota and returned? Question: Well, how do you know he went to Minnesota for sure? ANSWER: THAT’S OBVIOUS. HE TURNED OUT TO BE A DOPPELGANGER. Question: Hmmm. Do you have some kind of test for doppelgangers, like a blood test or some kind of DNA scan? ANSWER: THE BLOOD WILL NOT TELL. WHAT IS DNA? Question: Never mind about the DNA. It has to do with what we know about biology here in our world. It’s scientific. But just tell us what was so horrible about this whole doppelganger situation with Karol Tendt, would you? ANSWER: HIS IGNORANT WIFE TOOK HIM BACK. A MONTH LATER SHE BECAME PREGNANT. I’M AFRAID TO SPEAK OF THIS. Question: Please don’t be afraid. Perhaps Codicil 13 of the Verdantic Mysteries will protect you. Did something strange happen with her pregnancy? ANSWER: WHEN SHE WAS TO GIVE BIRTH, KAROL TENDT ACCOMPANIED HER TO THE HOSPITAL. IN THE DELIVERY ROOM WITH THE MEDICAL PEOPLE, KAROL TENDT EXCUSED HIMSELF AS HIS WIFE WAS IN LABOR. Question: What happened then, Dr. 58? ANSWER: KAROL TEDNT SAID HE WAS NERVOUS ABOUT THE TRAUMA OF WITNESSESING HIS WIFE IN BIRTH. HE LEFT THE BIRTHING ROOM. HE SAID HE WAS GOING TO THE BATHROOM. HE WAS NEVER SEEN AGAIN. Question: And then what happened? Did his wife give birth to a baby? ANSWER: SHE GAVE BIRTH TO A TROLL LARVA. Question: What? Wow! What is a troll larvae? What does that look like? ANSWER: LIKE A BIG INSECT LARVA. WHITE, FAT, SQUIRMY. Question: This sounds absolutely disgusting and horrible. So does this larvae hatch into a troll later, and what do you mean by a troll? ANSWER: YOU CLAIM TO BE FROM MINNESOTA BUT DO NOT KNOW TROLLS? Question: We know of them as mythical creatures. They are not real. They are humanoid, I suppose. But, basically, we would think of a troll as a kind of magical creature, like a fairy or elf. They might have green skin and pointy ears, and stuff life that. They might have lumpy faces or warts, and such. But these are just fairy tails. We do not consider them to be real. Or at least the vast majority of people do not. Does this sound like the what you think of as a troll? I should add, our mythical trolls do not generally start out as an insect kind of larvae in our tales. ANSWER: KAROL TENDT’S WIFE GAVE BIRTH TO A TROLL LARVA, WHICH LATER HATCHED INTO A TROLL NYMPH. Question: What happened then? I mean, what happens in your world when a human woman gives birth to a troll? ANSWER: IT WAS TAKEN TO THE GOVERNMENT SCIENCE INSTITUTE FOR STUDY. IT MOLTED RAPIDLY FROM NYMPH TO ADULT TROLL. IT IS BELIEVED TO HAVE ESCAPED. IT WAS NEVER SEEN AGAIN — BUT NO ONE BELIEVES THAT. WE THINK THE AUTHORTIES KNOW WHAT HAPPENED TO IT, BUT ARE NOT TALKING. Question: What happened to the mother? ANSWER: TOUCHED BY EVIL. SHUNNED. Question: How awful. Let’s back up here a bit. So the situation was this: Karol Tendt apparently went to Minnesota. He did not come back out, but rather a perfect duplicate of him came out, or a doppelganger. The double of Karol Tendt was so perfect that everyone, even his wife and lawyers, thought he was the real Karol Tendt, a normal human and husband. He impregnated his wife, then disappeared while his wife was in labor. She have birth to a troll larva, which later grew into a troll. It was assumed from this that Karol Tendt was actually a sort of troll in perfect disguise as a human being, and his purpose was to impregnate a female human with a troll baby. Are we getting this right? ANSWER: KAROL TENDT WAS A DOPPELGANGER, BUT WE DON’T KNOW IF HE WAS A TROLL. Question: Yet his offspring was a troll, so can’t we make that assumption? ANSWER: NO. KAROL TENDT IS THE ONLY DOPPELGANGER TO BE ASSOCIATED WITH TROLL ACTIVITY. Question: You know something, Dr. 58, if it wasn’t for the fact that we are communicating your via an Ouija board, we would simply say that you are just spinning a tall tale for entertainment. Please don’t take offense, but are you just another Ouija entity who likes to spew nonstop baloney, as is our experience often times with this method of communication? ANSWER: I DON’T KNOW WHAT AN OUIJA ENTITY IS. WHAT IS THAT? Question: It’s anyone of thing that communicates with us via the Ouija board. Are you just making up this story about Karol Tendt and the troll larva baby? ANSWER: I’M AN ORDINARY KID IN NEW YORK. I’M A PERSON. YOU SAY YOU’RE A PERSON. HOW DO I KNOW? YOU COULD BE A MINNESOTA TROLL MOCKING ME. Question: We are not trolls, we don’t think trolls exist. That’s why we find your story so fantastic. ANSWER: YOU MAKE STRANGE CLAIMS, TOO. ANSWER: YOU CLAIM TO BE IN THE FUTURE, IN THE YEAR 2010. Question: Well, you said you were in 1951, and all we know is that we are in 2010. I don’t know what else to say but that’s the truth. We make no strange claims. We’re just being honest with you. Why is it again you are speaking with us? You claim it is illegal and you are afraid, yet here you are talking to us. Do you live with your parents, and do they know what you are up to? ANSWER: YES, I LIVE WITH MY MOM AND DAD. THEY DO NOT KNOW WHAT I AM DOING. THEY WOULD PUNISH ME. THEY WOULD BE FRIGHTENDED AND HORRFIED THAT I CONTACT MINNESOTA. Question: So why are you doing it then? ANSWER: I AM CURIOUS. I WANT ADVENTURE. I LISTEN TO THE STORIES OF OLD CAVE ON THE STREET CORNER. I WANT TO KNOW. Question: So Old Cave, that’s the Mad Priest, the former Father Reston Vromin? He now stands on the street corner and tells stories about the strange land of Minnesota. Is that the case? ANSWER: NOT MINNESOTA. IT’S ILLEGAL TO SPEAK OF IT. HE STANDS ON THE CORNER OF WEST 8TH ST. AND 5TH AVENUE AND I LIKE TO LISTEN TO HIS SERMONS. SOME PEOPLE CALL THEM RAVINGS. Question: But it is assumed his raving concern knowledge gained in Minnesota, even if he is careful not to say so? Question: Well, did Old Cave somehow manage to escape prosecution for his illegal trip to Minnesota as well? Did he have a good lawyer, too, and how do you know he is not a doppelganger? ANSWER: HE IS NOT A DOPPELGANGER BECAUSE HE DOES NOT LOOK LIKE HIS OLD SELF ANYMORE. HE CAME BACK FROM MINNESOTA BENT OVER, BALD, AND WITHERED. Question: But everyone is still certain that this Old Cave, as you call him, is still the former Father Vromin? And how did he escape the law? ANSWER: MOST THINK IT IS FATHER VROMIN. I THINK SO. HE IS NOT A DOPPELGANGER BECAUSE HE LOOKS UNLIKE THE FORMER FATHER VROMIN. Question: Well, maybe it’s not him at all then, then? Does Old Cave claim to be Father Vromin? ANSWER: NO. BUT IT MUST BE HIM. THE BIRTHMARK ON HIS FACE IS IDENTICAL ON HIS WITHERED SKIN. Question: What kind of birthmark does he have? ANSWER: A LARGE “S” MARK ON THE RIGHT SIDE OF THIS FACE. Question: Why wasn’t he prosecuted for going to Minnesota? ANSWER: THERE IS NO POLITICAL WILL. HE IS OBSCURE. A HOMELSS MAN WHO WALKS THE STREETS. HE NEVER TALKS ILLEGALLY ABOUT MINNESOTA. HARD TO PROVE HE WAS THERE. Question: Did the original Father Vromin announce that he was going to Minnesota? ANSWER: YES. HE BELIEVED THAT THE POWER OF CHRIST WAS ALL POWERFUL, MORE POWERFUL THAN ANYTHING THAT MIGHT EXIST IN MINNESOTA. Question: So he was kind of a holy missionary for Christ, on a mission to tame the weird and magical land of Minnesota, and bring it under the control of the power of Christ? Question: How long is it believed he was in Minnesota? Question: Well, why did he not return to his church and his priestly duties? ANSWER: HE MUST HAVE LOST HIS FAITH IN MINNESOTA TO SOME MAGIC THERE. Question: So, now does he preach about the Catholic faith as being false? ANSWER: NO, HE DOES NOT TALK ABOUT RELIGION. HE TALKS ABOUT MANY STRANGE THINGS. Question: Such as these Verdantic Mysteries you mention? ANSWER: YES. FATHER VROMIN WAS KNOWN TO HAVE A PHOTOGRAPHIC MEMORY, AND SO HE COULD HAVE MEMORIZED THE VERDANTIC MYSTERIES IN MINNESOTA AND BROUGHT THEM BACK HERE. Question: So he wrote them down and published them, or what? ANSWER: NO. OTHERS SCRIBED HIS TEACHINGS. FOLLOWERS. THERE IS A SCROLL. Question: Someone wrote down the Verdantic Mysteries onto a scroll? Question: And you have a copy of that scroll? ANSWER: YES. I OBTAINED IT FROM A CRIMINAL. ANSWER: IT IS FEARED THAT THE VERDANTIC MYSTERIES ARE FROM MINNESOTA, AND THEREFORE, ILLEGAL. Did I really have a conversation with a long-dead ancestor via the Ouija board? In this session, we contact an ancient oceanside dweller who happened to be in serious trouble at the time. This is one of those Ouija sessions that envoked a lot of cosmic issues, while at the same time, some very down-to-earth issues about life, death and existence.